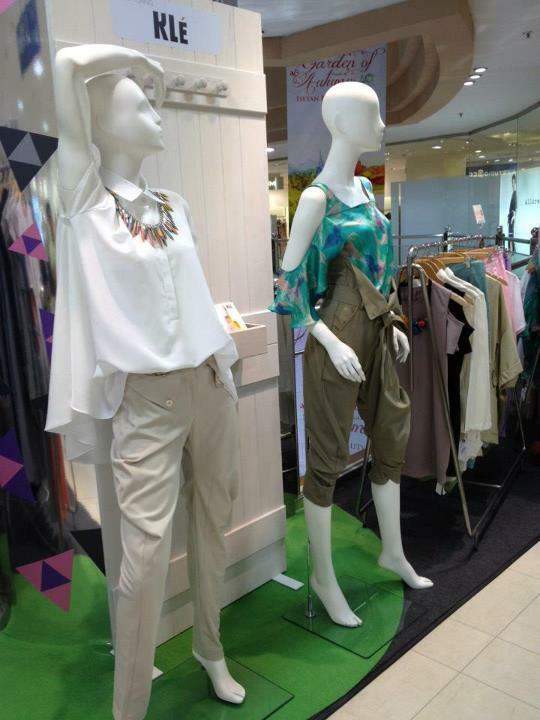 Bonjour Singapore: Fashion blog with a focus on Asia: Isetan: Bringing Jakarta Fashion Week to Singapore! In total there were 6 labels. For clothing, it was KLE, Hunting Fields and Major Minor, for accessories: Antyk Butyk and Frej and one lifestyle label called Canvas Living. Clothing-wise I really liked Major Minor collection which by the look of it took inspiration from Van Gogh’s painting in terms of colours (navy blue and yellow) and even replication the pattern of Starry Night (one of my favourite paintings ever) in some of their tops. The overall feel of the collection was effortless and ease but with a bit more colour. The textures were also mostly soft where a lot of chiffon used. Does this remind you of any particular work of art :-)? I also liked Hunting Fields especially their edgy yet soft cuts which are a bit unusual and interesting although most of the pieces came in black or a light shade of grey. I even tried on an ankle-length dress which I really loved, only to find that it was a bit too big for me. Overall, this label kinda reminded me of Singaporean label Max.Tan with its take on structural silhouettes but with a more feminine edge. The third clothing label is KLE, another new emerging label from Indonesia which does chic with a twist. Most of the pieces were easy-to-wear casual chic and it had a lot of mix and match separates especially comfy looking bottoms which can become a challenge in this heat! KLE is all about comfortable and chic cuts for everyday wear. Love how effortless and cool this KLE outfit looks! Accessories-wise, both labels stood out. I especially loved the Antyk Butyk creations ranging from necklaces pieces made from a variety of material like Perspex and acrylic geometric pieces in a bright colour palette and interesting shapes. Every single piece on display was truly unique and beautiful which explains why even Cleo Indonesia magazine has nominated this label as the ‘Most Promising Accessories Brand at the Jakarta Fashion Week. I’ll definitely be looking for this one when I’m in Jakarta! For those less adventurous, the label also offers some more toned-down styles which could go with any daily outfit. Designers' Week at Isetan Scotts is running until the 25th of September so make sure to pop by and check out these cool Indonesian labels while they’re in town! More info on their facebook page here.